Airleader is a leading German manufacturer of the award winning Compressor Master Controller Professional. The demand logic and the self-learning capability are second to none. The Airleader Master Controller delivers higher energy savings as OEM offered controllers or sequencers. The universal interface makes is possible to connect to any compressor brand and model. The Airleader Web-Server comes as a part the master controller, because they believe that without a monitoring system is impossible to keep a compressed air system tuned. Integrated e-mail features are available for alert and maintenance e-mails. 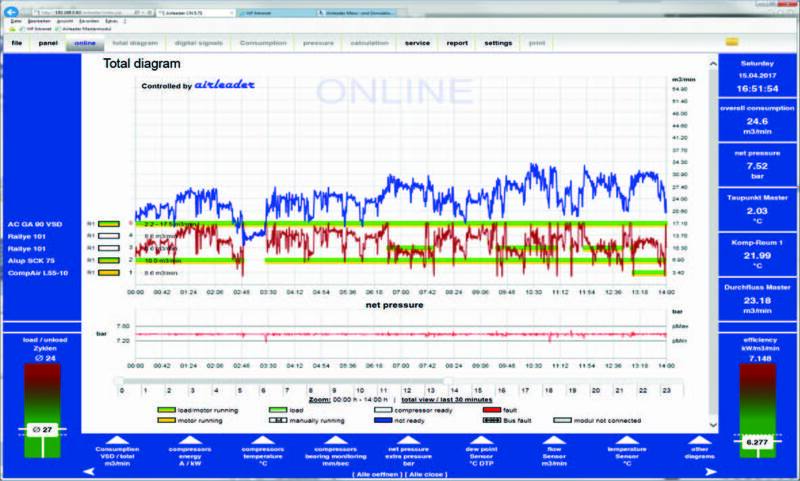 The Airleader Master Controller Professional can also be used as a continuous data logger / monitoring system. Data is stored for years to come and can be downloaded for investigation (baseline) and verification (post) reports e.g. as required for custom utility incentives projects. The OPC Server is available to transfer any data point into a Third-Party monitoring system.